This is the second product from UNi that I have had a chance to review. The first product was their 100% Organic Pure Moroccan Argan Oil which I still use today and enjoy very much. Now I am a fan of UNi’s 100% Rosehip Seed Oil too. Their Rosehip Seed oil is both USDA Organic and ECO Certified by ECOCERT ICO, chemical free, with no additives. The Rosa Canina (Rosehip Seed Oil) is imported from Chile and bottled in the U.S.A.
Rosehips have been used by ancient Egyptians, Mayans and Native Americans all because of their healing properties. The beauty industry is starting to see the benefits of these healing ingredients as an alternative to the chemicals they have relied on in the past. Rosehip seed oil is a natural source of antioxidants, essential fatty acids, and vitamins C & A which aids in regenerating skin cells and repairing damaged skin tissue. The oil is a beautiful rich amber color that absorbs quickly into the skin leaving it soft, supple and moisturized. The oil has a light natural scent that quickly fades away. 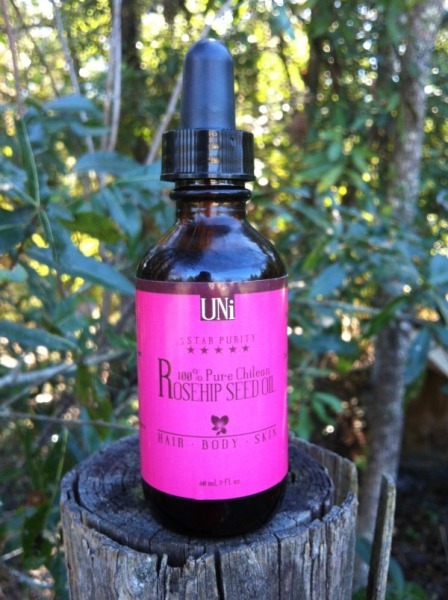 I like to use my Rosehip Seed Oil on my face, neck, hands, and any other dry or trouble spots on my body.